Like the name suggests the Ranging Guild is a Guild where people go to range. There's something for everyone here, from killing archers to playing the ranging Activity! There is also an archer here who will sell you the Archer's Skill Cape/Hood upon completion of achieving the hard task of 99 Range for 99,000gp. You may use a Temporary Stat Booster to gain access to this guild. The Ranging Guild is located a short distance northeast of East Ardougne. Completion of the Plague City quest is required to use this method. 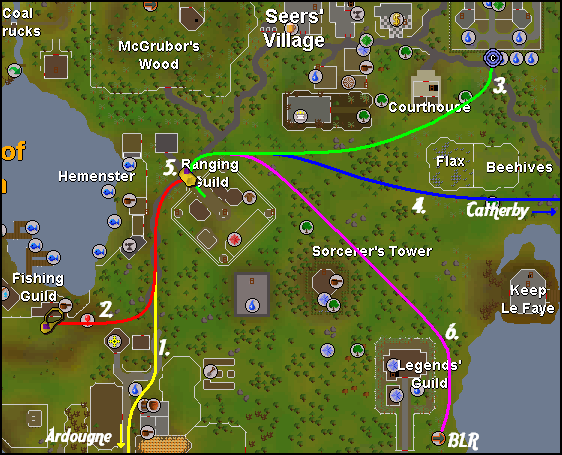 With 51 Magic, teleport to East Ardougne with 2 Law runes and 2 Earth runes and then follow the yellow path. With an Ardougne tele-tab, simply break it to teleport to East Ardougne, then walk yellow path. Teleport to the Fishing Guild and walk from there to the Ranging Guild. Requires 72 Crafting to make it as well as 68 Magic to enchant it. It may also be bought from other players. The Ranging Guild is located to the west of Camelot. With 45 Magic, gather one law rune and 5 air runes, and teleport to Camelot. Then walk the green path. If you have done Lunar Diplomacy, with Lunar Magics set, you will need 87 Magic to use this method. Teleport to Catherby with 3 Astral, 3 Law, 10 Water runes, and then follow the long blue path. Teleport directly to the Ranging Guild. Use Fairy Ring code "BLR" to teleport southeast of the Legends' Guild, and walk from there to the Ranging Guild. 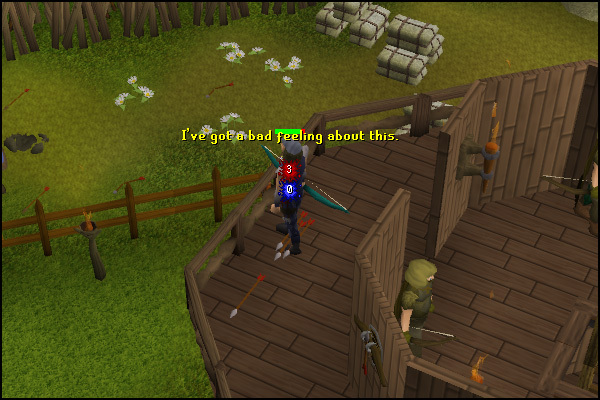 There are quite a few attractions in the Ranged Guild, many of which can help you train Ranging. 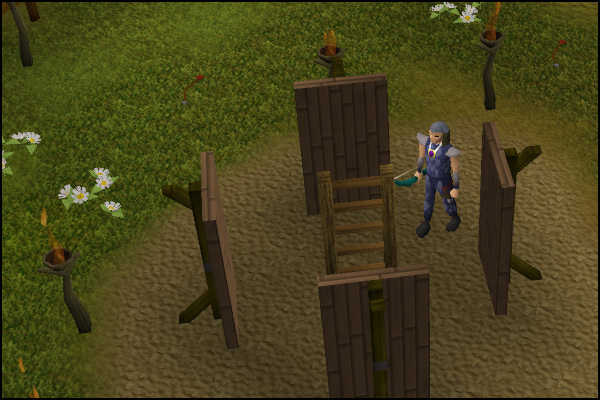 There is a ladder located at the center of the guild, which if you climb up you will find one of four Tower Advisors. Depending on your Range level they will suggest which the tower is most challenging for you. Each tower has three archers, and are respawned at around 20 to 30 seconds. If you're bored, the guild has an Activity that you can play! 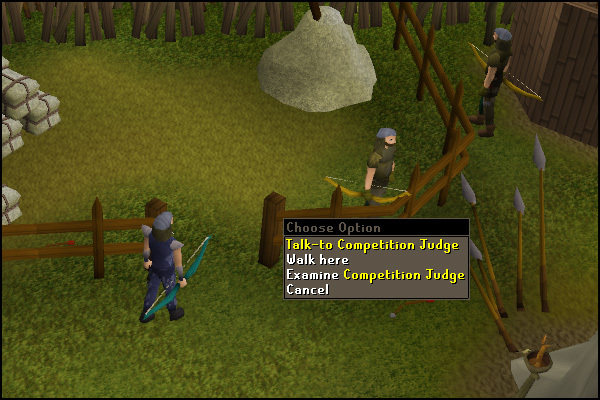 The Competition Judge can be found in the southeast corner of the guild. 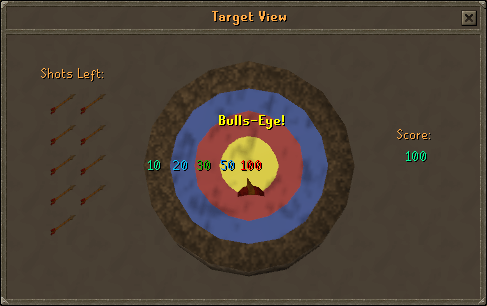 Move your mouse of over one of the targets and click "Fire at target" to shoot an arrow. A screen will appear and display the points you earned from your last shot, the number of arrows you have left, and your current score. Shots Left - You have 10 arrows (shots) to start with, and once you run out, the game ends. Target - The center area displays the target, and the area which your last shot hit. In the above image, a bulls-eye was hit. It also shows the number of points you have earned from the last shot. Score - This is your total score from the current game. You start with 0 points, and can earn up to 1,000 in total. You will be rewarded archery tokens for the amount of points you get divided by 10. So, the maximum is 1000 (1000 / 10 = 100) points per game, giving 100 tickets. So, if you play the game 10 times with 1,000 points each of the game, you will receive 1,000 tickets! Not a bad deal, huh? For more information on this Activity, visit the Archery Competition guide. Here you can buy a variety of range Armour's for all your dangerous adventures. If the bows and arrows are not your preferred type, this shop has stocks of the throwing weapons that can be purchased. The tickets you get above can be used to purchase the items without the need of money! As well as being the only shop in the guild that needs the tickets, it is also a good shop to buy some items that in other places in Runescape would be unavailable.